Fat Quarter Shop asked if I'd be interested in sewing up their newest design as part of their AGF Stitched with Kimberly series. 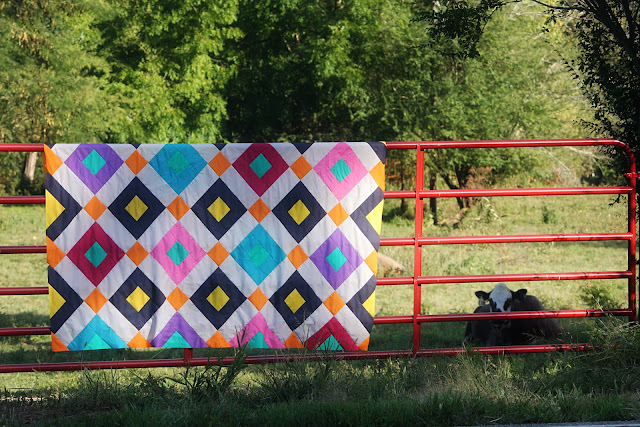 The quilt is called Welded and is super simple in it's construction but packs a real visual punch. I chose to work with all solids and took my color inspiration from the Fat Quarter Shop Tokyo Solid Fat Quarter Bundle. Tokyo bundle kind of cracked me up because have I mentioned that I live in the sticks? Like, I couldn't be further from Tokyo if I tried. 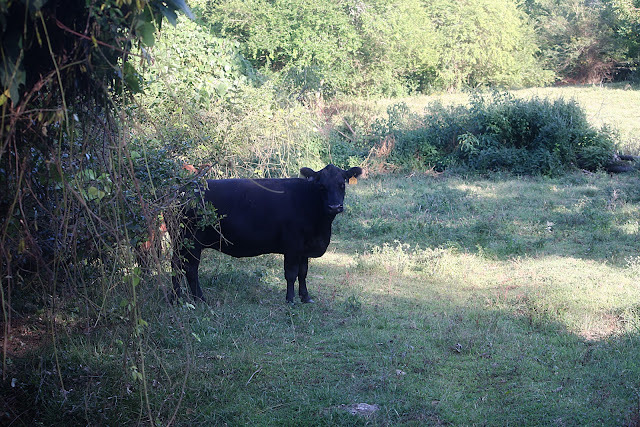 I think the cows were even smirking and saying, "Tokyo? Whatever!" in their minds. I loved how quickly this Welded Quilt sewed up. 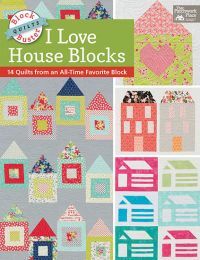 Fat Quarter Shop has a video tutorial to show you how to make the blocks and includes great tips and tricks on how to trim it perfectly at the end. If you want to make their exact version of the quilt you can find quilt top kits and backing kits available in their shop too. 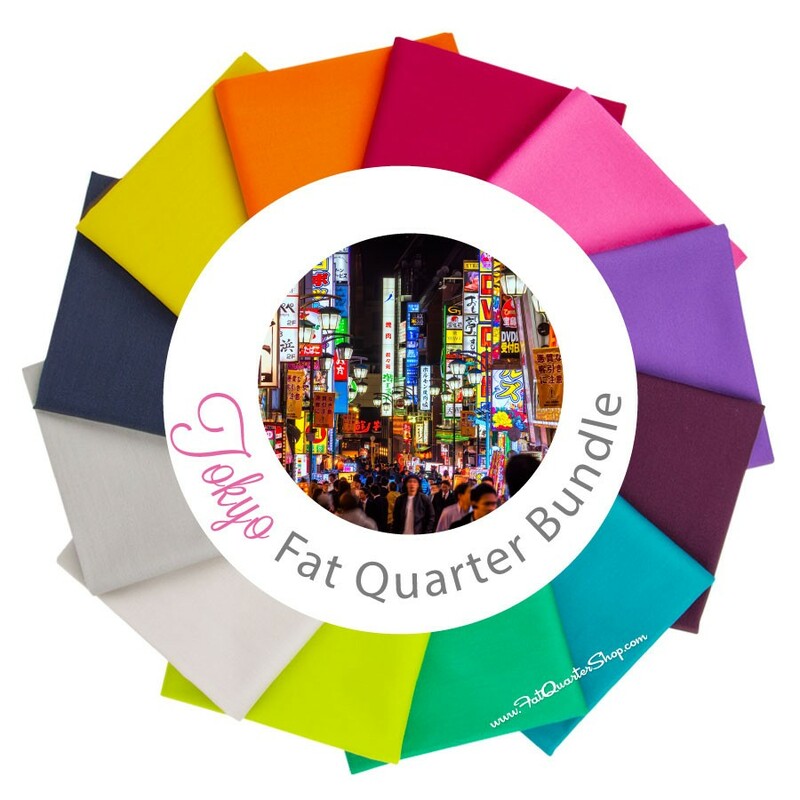 And, because Fat Quarter Shop is awesome (and I think they secretly want the cows to laugh at me harder,) they have offered up a Tokyo Solid Fat Quarter Bundle for one lucky winner here today. Please note that the bundle will not contain enough yardage to make the Welded Quilt but it will certainly get you headed in the right direction. Leave a comment here telling me what colors and or fabrics are your favorites to use this time of year for your chance to win the fabric bundle. I'll close the contest and pick a winner on Monday, September 28, 2015. Winner will be selected by smirky cow. Not really. Just checking to see if you're still reading. 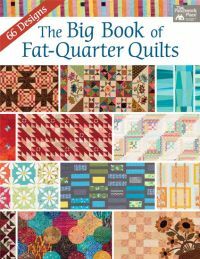 Thanks for the great pattern and giveaway Fat Quarter Shop! The trees are turning orange here and that is my favorite color - year round! I love your Welded in solids, it's so vibrant. Thanks for the chance to win. I like to sew with Apple reds and pumpkin oranges in the fall. Lovely quilt!! I love autumn colours on the trees but I don't ever want to wear them or have them in my house in soft furnishings! Purple is always my go-to colour, and it works for fall as well as the rest of the year. Thanks for the chance to win! I love sewing with holiday fabrics! Halloween, Christmas, so many holidays coming up! I rarely make a quilt without using white and aqua. But this time of the year I'll tend to add brown and orange to my quilts, too. I love all fabric all the time! Right now I am working with homespuns. Hmmm....I do love me some brown, orange and teal at this time of year with a little pop o'purple! I love to use shades of grays this time of year - reminds me of November skies - and then punch it up with bright clean solids! Smirky cow! LOL I find that the time of year doesn't really seem to effect my color choices. 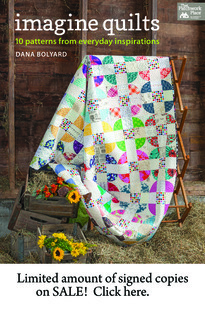 . . bold and beautiful seems to be the only requirement ;) I love this quilt in solids and this bundle is gorgeous! 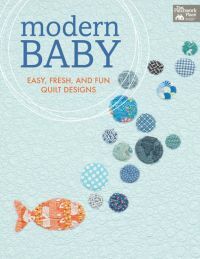 I'm working on a baby quilt from stash right now... working in ALL THE COLORS. Trying my hand (fingers crossed) at some value piecing. Working on a rainbow quilt right now! Lots of color! This time of year calls for warm colours - oranges, golds, dark greens, reds - any colours that remind me of autumn in Ontario. Fall has always been my favourite time of year and its colours just warm everything. I always seem to be drawn to jewel tones. Blues and purples specifically! Those cows are too funny. I always like orange, as well as purple and green. But my absolute favorite isn't a color, it's a zebra - I put one in each quilt I make. I too, live in the country and know cows. They're funny creatures, curious, they can be counted on to stand there and look at whatever is going on. So if you need an audience, go find a bunch of cows! I like to sew with brights year round. They just make me happy. I love how the solids pop in this quilt, and enjoyed the pictures of the smirky cow. Secretly hoping the flattery wins me a win. Hee Hee! This time a year I'm a sucker for anything orange, black, red, gold or Halloweeny! Actually, I'm a total sucker for Halloween fabric at ANY time of year. But always too afraid to cut into it! I saw your quilt on Instagram. It is gorgeous! I've never made an all solid quilt and I even made it a New Years resolution but not any closer to that goal yet. Right now I'm focused on making quilts for my guilds 100 quilts for kids drive that ends this month. And I'm keeping up with my vintage farmgirl quilt too! Yee-haw! I love just about any combo of blues and greens. Beautiful job, Dana! I can hardly stand to make a quilt without green in it--but fall's maroon, gold, and rust inspire! Not that fall is happening at the moment... Thanks for the chance to win! 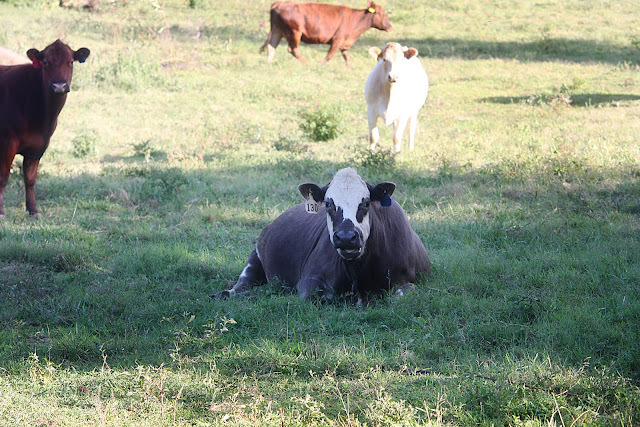 Hey Smirky Cow, pick me! I love aqua in quilts, pretty much any time of year. I like blues and greens. As Autumn arrives, I am compelled to pull ou saturated rust, orange, red, & gold fabrics. I love these colors! I love the oranges and reds of the leaves. I am in love with Sweet As Honey by Bonnie Christine right now! I love your quilt! Tan, burgundy, and pumpkin orange. Funny I would have said rusts & deep orange but just looked at the bag of fabric I brought home for local quilt show today & they were all greens & browns..... except the Star Wars.... Love the solid color choice you made. Amazing how different this pattern can look with each fabric selection. I like sewing with greens. The colors of fall--yellow, brown, shades of orange, red--have all found their way into the newest quilt project. A simple 3 block tablerunner in those colors is ready for the binding. Love the bright colors in the Tokyo bundle. Summer project using these colors would be grand. Thanks for the giveaway chance. I love to use oranges and yellows this time of year and throw in a pop of red sometimes. I seem to skip fall colors and go right into Christmas sewing. So I'm starting to sew red and green, my favorite Christmas colors. love your color choice. Thanks. Hey, Smirky Cow, I have an armful of fresh corn cobs for you! Come closer! I love close to cows, too, but only close enough to drive past them, so I know how you feel! These colors are so bright and lovely...perfect for your quilt and you did an outstanding job! I love my blues and purples year round! My color choices are not influenced by the season. I tend to choose a lot of aquas, teals, blue-greens, blues...colors of the Caribbean, Maybe that is because being on a tropical beach is my dream. This is so bright and different from the other versions. I know about the sticks...we gave up counting the number of antelope we pass on our way to town. I haven't made a fall quilt yet, but every fall I wish I didn't have so many other projects in the works so I could start one. Hi Dana, I live on Cape Cod and always sew with shades blue, no matter the season. Thank you for the chance to win some fabric. Moooooo! I like reds at the moment. Who knows why but you can't beat a red and white quilt. Your quilt is gorgeous. I love solid quilts with lots of colour but tend to use a lot of blue and purple in my quilts. Your quilt is beautiful. Right now I like lot of cream and orange. I'm looking for grays and yellows right now - soft with bright for a quilt to make for my sister. The time of year does not influence my choice of colours. It's a good thing because I don't usually finish a quilt in the same season as I start it! hehe. I want to start going more modern in my print choices. I'm going to have to change quilt shops to do that. I think I would still do this in solid pure colors - however it might be really neat in batiks or blend of shades of the colors. Thanks. Red is my go-to color almost anytime of the year, especially close to the holidays. Thanks for the giveaway! i like the autumn colors of oranges, reds, tans and browns. I like fall colors, even though it is over 100 here right now! Too early for Christmas colors. I love blue and green all year around! Although I love rich fall colours, I find myself sewing Christmas fabrics now. Thanks for the chance! I like to use all different colors at all times of the year. My color choices really depend on the project. The Tokyo palette produced a stunning quilt. Thanks for sharing. This time of year I love to work with oranges, golds, reds and browns---just like the colours of the autumn leaves. I love the blue, green and purple family of colors. I find those are the first fabric bins to need refilling and my first gel pens to need replacing. I like Smirky Cows! My current favorite fabrics to work with are bright colors highlighted by black and white. 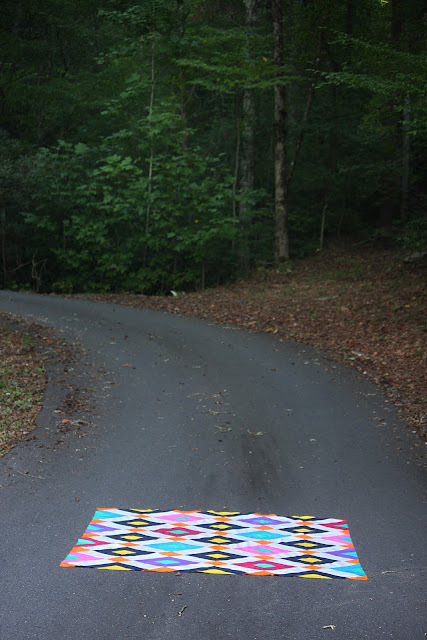 Thanks for the giveaway and for sharing your gorgeous quilt! I went back east for 3 weeks this summer. I had forgotten how wonderful all the greenery is. I'm hoping to make a green quilt soon. 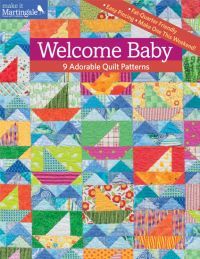 This is a fun bundle and a really cool quilt. I'm loving navy and mustard lately and I'm using it in so many combinations. I love to work with bright colors any time of year, and often start off with purple accompanied with wacky combinations of many others. I would use the colors of fall, golds,reds,yellows,and browns. Thanks for the chance to win some material. I like using the reds,golds, greens,and blue of the sky. I am having fun working with oranges which is a big change from the bright colors of summer. I love fall colors, but am amazed how brighter colors are being included in with fall colors! Living in Utah, where we see the beautiful transition from summer to fall is nice to. The colors in the post are a great mix and love the name of the collection, the picture really brings them altogether. thanks, Tracey. Autumn is my favorite season! I love the oranges and rusts! I'd like to use navy and greens (maybe a little purple thrown in). Trees everywhere are sporting orange, yellow and cranberry red in their leaves. The sky is a clean aqua blue, brilliant against the contrast of the leaves. Nature's's beauty on full display and the perfect palette already chosen for a beautiful quilt! Thanks for the opportunity, fingers crossed! I'm a scrappy quilter. I love all the colors ,together! I love the rainbow colors. But I would choose purple as my favorite. Thanks for the giveaway. I would choose the cool side of the color wheel. Love the blues, greens, purples. Lately I've been drawn to navy and yellow. I'm sewing with pink, orange, yellow, red this fall. A first for me as usually l like blues, purples, pinks. Your quilt turned out gorgeous! Thanks for the giveaway! I'm working in purple and pink at the moment but my favorite combo right now is grey and teal.